There will be an Arena Driving Trials held at Willow Brooks Farms on March 16, 2019. See the details on the Gladstone FaceBook page or the Omnibus entry. The results of the ADT competition held on March 16, 2019 are now available. They are available under the Results > 2019 ADT Results menu item to the left.. I went to see Gladstone property last week and it held up better good over the winter. As always a lot of branches and sticks to pick up. With that being said I am going to cancel the work day for this Saturday. The next scheduled day is April 6th, I will send out an email and give an update next week. The 2019 competiton will be held on May 18-19, 2019 at Hamilton Farm Golf & Equestrian Center, 1040 Pottersville Rd, Gladstone, NJ 07924. The entries will be accepted from March 18, 2019 through April 26, 2019. Any entries postmarked after April 26 will be returned. A flyer for the event can be downloaded here . Stable will be open at noon on Thursday May 16. The secretary will be available at noon on Friday May 17. For more information, visit the American Driving Society Omnibus entry. If there is any conflict between this web site and the Omnibus, this site has the correct information. To watch a video of the Foxes Den on YouTube, click this link. The Gladstone Arena Driving Trials was held at Willow Brook Farms in Northampton, PA. There were 13 entries in the event. Although it was a cold and windy day at the farm, everyone had a good time. We are planning to hold this event again next year. Link to the results is here and the pictures are here . 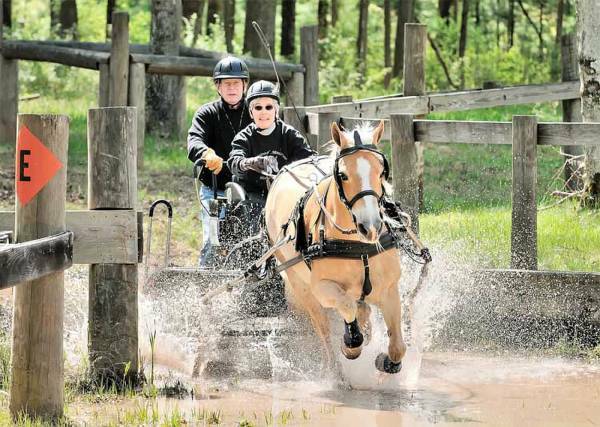 There is also a FaceBook page for Gladstone Equestrian Association Driving provided by John Hoffner. Go to https://www.facebook.com/GladstoneHDT2018/ to see the pictures, videos and posts. You do not need a FaceBook account to see the pages, only if you want to add your own pictures or posts.